Welcome back, my DIY friends? Cutting Edge Stencils hopes your week is off to a rockin’ start! Our Paint-A-Pillow news certainly put us in a good mood this week. OK, so we’re here to talk about your teen’s bedroom. You probably still love the adorable little kid room that you painted years ago. But that little kid who inspired that adorable space is not so little and you need to make some major updates fast. That’s where we step in. 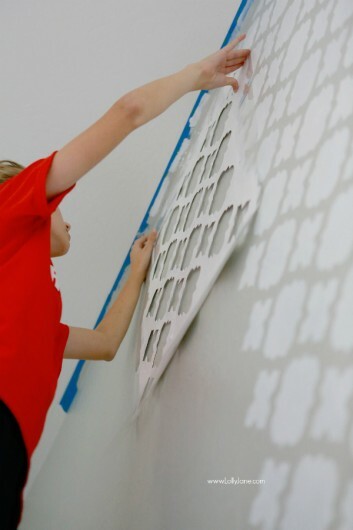 We are sharing a budget-conscious, DIY, teen room makeover that is rockin’ with style and stencils. Meet Kristi and Kelli, the creative queens of DIY and clever duo behind the blog Lolly Jane. Today they’re sharing a teen bedroom makeover that has such a sweet story behind it, we know it’ll melt your hearts. Kristi and Kelli belong to a church in their community. The church has a program that sends 12-18 year old girls to a Girls Camp every summer for a few days. The kids love the camp and the summer memories it generates. Since the church needs to raise $50 per child, it hosts a live auction fundraiser. Kristi and Kelli offered up a room makeover in the live auction and were blown away when they managed to raise $1,000. The lucky winner of this fabulous room makeover was a local 14 year old girl, Miss L! Miss L had an adorable little girl’s room that was painted chocolate, bubblegum pink, and lime. At the age of 14, she was ready for something a little more sophisticated and stylish. 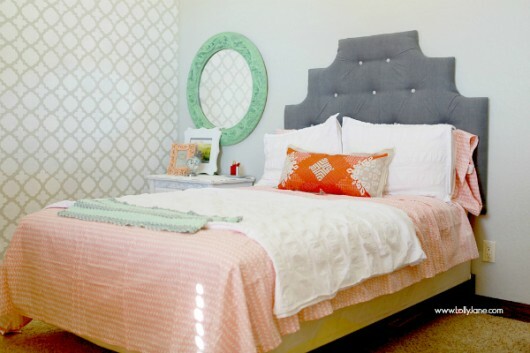 She searched on Pinterest for bedroom inspiration and shared her favorite room ideas with Kristi and Kelli. Together, they helped make her dream a reality. 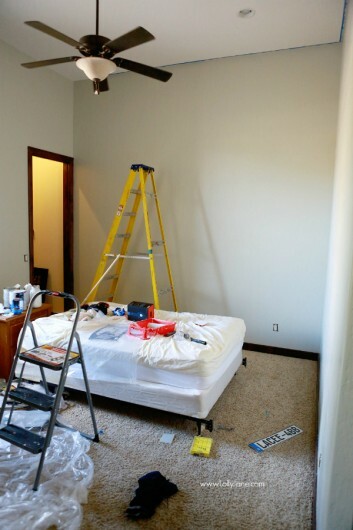 First the walls were painted a neutral gray hue, Timberwolf by Dutch Boy. Since the bedroom has a very high ceiling, Kristi and Kelli felt an accent wall was the perfect way to make a statement. They chose our Moroccan Tiles Allover stencil, it’s one of our rockin’ Moroccan patterns. After they painted the walls gray, they stenciled the pattern in white. They used painters tape to hold the stencil to the wall and a dense foam roller to paint. Since stenciling is super easy to do, even Miss L took a turn painting on the pattern. Drumroll, please! Here is the gorgeous new bedroom that Kristi and Kelli created for Miss L. We absolutely love how pretty the Moroccan pattern brings sophistication and style to this space. Kristi and Kelli had this to say, “It’s so pretty!! 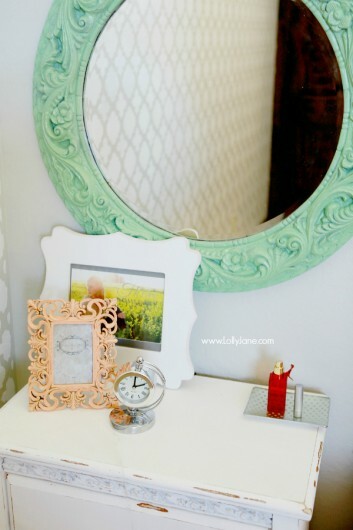 Doesn’t it look fabulous with her mint + coral accessories?” Can’t argue with that! All photography is by Jennette Jenkins Photography. So tell us what you think, would you have loved to have this space as a teen? Leave us your thoughts in the comments below! Buy a Moroccan Tiles Allover stencil and jazz up your space! Create your own custom designer pillows with our Paint-A-Pillow stencil kit! Have you completed a stencil project recently? Come share it on Facebook! We love seeing our fan’s stencil projects!